Two straight weeks of blogging and drinking the hard stuff – I’m so caught up in this calendar that I barely noticed Christmas is a week and a half away. What am I going to do without 50 mL of whisky before bed every night? Ten more days! Lovely scotch; worst label of the 14 to date by far. The KWM Whisky Advent Calendar seemed to be gradually scaling upward as the days went along, both in terms of the pedigree and age of the whisky and in terms of the bottle price, but tonight represents a bit of a reset on both fronts. 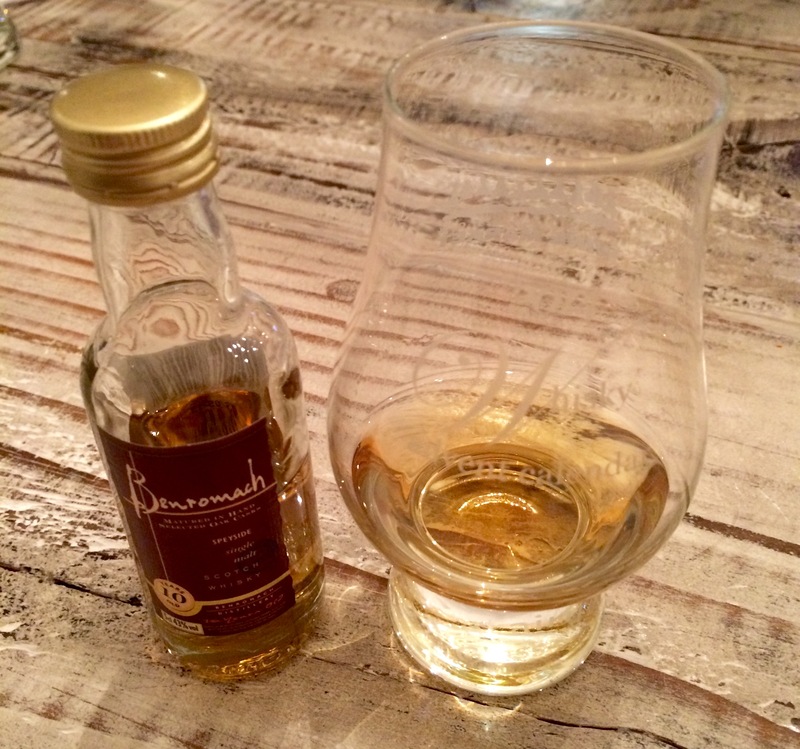 The showcase whisky is probably both the youngest and the cheapest single malt of the bunch so far: the Benromach 10 Year Single Malt scotch from Speyside, clocking in at a mere $68 for a full bottle. This whisky aged for 9 of its 10 years in 80% bourbon and 20% sherry hogshead casks before being finished in its final year in – wait for it – first fill Oloroso sherry casks. Sigh. Benromach has the interesting distinction of being the smallest distillery in Speyside, which is basically the core region of scotch production. There is a super fun contrast here between how this whisky smells and how it tastes. Its aromas are all tangy and salty, a true seaside nose, all wet sand, barnacles and seaweed, showing off its sherry influence (and maybe the slightest bit of peat?). But rather than following suit and tasting savoury, briny and abrasive, it’s a total lovefest on the tongue, unexpectedly viscous and silky, with a hearty and sweet core of brown sugar on oatmeal surrounded by equally delicious flavours of maple, baking spices, cardamom, Fig Newtons and toffee. Most of these fall off quickly after you swallow, but a lone burnt sugar note lingers. Thank you Bourbon barrels. I would have made a point of saying that the label on this scotch is absolutely abysmal, but Benromach appears to have already changed it to something much more pleasant and striking, so way to read my mind ahead of time, Benromach. If there’s a whisky equivalent to a house wine, a cheap and cheerful bottle that you always have on hand to meet any circumstance, this could easily be yours.